Our art room is fully equipped for creating artworks in a broad variety of media. The art program encompasses the teaching of skills and art appreciation whilst promoting individual creativity. Throughout the year the children are exposed to a variety of focus areas. Drawing, painting, construction, puppetry, mosaics, modelling, threads and textiles, printing and clay are all examples of the areas presented to the students during their Art classes at Mano. Student art works are prominently displayed throughout the school and beyond into our community. Manifold Heights is always part of the Geelong Show and student work has been on display at both the Geelong Gallery and Geelong West Library. Every second year, our School Art Show invites the school community into our school to delight in the work of our students. We aim to promote the visual arts to the community and engender an appreciation of art amongst the children. Once again the Senior students are in the process of making Indonesian puppets. It has become somewhat of a tradition that every second year the Seniors undertake this very challenging task. The puppets take many weeks to complete. So far the students have used a polystyrene egg, a piece of dowel, newspaper, cardboard and wire to construct the puppet. These pictures show the plastering stage, which is one of the highlights of the whole process. Modroc is the same plaster that is used for broken bones. Small strips are dipped in water and the applied to the headpiece, arms and body. Great Fun! At Manifold Heights Primary School, the L.O.T.E. program (Languages other than English) focuses on Indonesian language and culture. Students also get involved in activities related to Indonesian festivals and customs. All students from Prep through to Grade 6 learn Indonesian for one hour per week. The Physical Education (PE) and Sport Program at our school encompasses fitness, skills, movement, dance, gymnastics, games, aquatics, recreation and sport. It also aims to promote the enjoyment of physical activity by providing interesting and motivating activities while improving the student’s knowledge, skills and behaviours. Our PE program also aims to develop our values – resilience, respect, motivation and inquiry in all children as well as develop their personal and social skills. PE introduces the children to many forms of physical activity ranging from individual involvement to non-competitive activity through to competitive team games. Emphasis is placed on combining motor skills and tactical knowledge to improve individual and team performance. Students also learn how developing physical capacity in areas such as strength, flexibility and endurance is related to both fitness and physical performance. Students in Grades 3 – 6 are given the opportunity to participate in Athletics, Cross Country, Swimming, Inter-school Sport and Lightning Premierships throughout the year. Students in Prep – 2 also have an Athletics Day during Term 4. 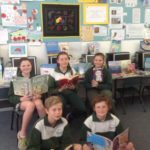 The Library program at Manifold Heights Primary School encourages students to develop an appreciation and a love for reading books. The Library has a broad selection of picture story, fiction and nonfiction books and is well equipped to meet the interests of our students from Prep to Grade 6. An older readers section has been established to cater for the Senior students and this resource will continue to be extended. The Library is an inviting learning environment that encourages students to visit and read books during lunchtimes. It celebrates books and our students’ responses in the form of colourful and informative displays. The weekly Library program provides students with clear guidance in locating and selecting books to read and borrow on a regular basis. Students are presented with opportunities to take part in discussions about authors and book themes, and explore the many connections to personal experiences and world events. 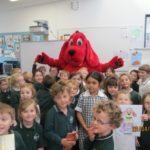 The program supports Inquiry projects across the school, classroom libraries, “Just Right” reading sessions in classrooms, Book Week activities and The Victorian Premiers’ Reading Challenge. Held twice a year, the Scholastic Book Fair is an integral part of the School Library program. It is an exciting social event that provides students and the school community with opportunities to purchase from a wide range of books. All proceeds from the Scholastic Book Fair go towards new resources to enhance our Library’s collection. The Music program at Manifold Heights Primary aims to develop both practical skills and theoretical knowledge. Students learn about, listen to and engage with a variety of different music styles. They work on their singing skills and play instruments such as guitars, ukuleles, keyboards, xylophones, boomwhackers, marimbas and a variety of percussion instruments. Students are guided to perform with correct technique and a strong sense of rhythm and pitch, becoming confident and well-informed musicians. Students are taught the conventions of music notation. They read melodies on the treble stave, compose rhythms to play on instruments and write their own chord progressions. Students also engage with music through analysis, commenting on the elements they hear, discussing the meaning of lyrics and the function that music serves in society. There is also the opportunity to participate in the Mano Band, Mano Choir and Uke Club. These ensembles rehearse at lunchtimes and perform for the school community. Science is a specialist subject at Manifold Heights for children in Grade 3 – 6. Students develop their understanding of Science in our world and how it relates to everyday life by using hands on STEM (Science, Technology, Engineering and Mathematics) based activities, along with building on their ability to ask clarifying questions and make predictions about scientific investigations. Each term has a different topic of focus, based on the Victorian Curriculum and often coincides with a topic the students are learning about with their classroom teacher. Students also have the opportunity to participate in ‘Science Week’ which is held ever year in August. It is an opportunity for students to complete tasks and/or experiments related to the year’s theme.